Earn a $1000 after your first 125 rides when you Drive in Michigan. Terms apply. Get $1000 after your first 125 rides when you Drive for Lyft in Colorado. Terms apply. Get a $250 bonus after your first 100 rides. Limited time only. Terms apply. Get a $300 bonus after your first 100 rides. To supplement your full-time job or a part-time gig, drive with Lyft to get the extra cash you need. For a limited time. Terms apply. With more Lyft riders joining all the time, Get a $300 bonus after your first 100 rides when you become drivers. Terms apply. Start driving with Lyft and earn a $1000 after your first 125 rides. Terms apply. Get $2 Credit per ride for 10 rides. Void where prohibited. For a limited time! Earn a $1000 after 125 rides when you become a Lyft driver. Terms apply. Earn a $1000 after your first 125 rides when you Drive for Lyft in Providence. Terms apply. Get a $300 bonus after your first 100 rides when you Drive in Michigan. Terms apply. Earn a $300 bonus after your first 100 rides When You Drive for Lyft in New England. Terms apply. Get a $1000 after your first 125 rides when you Drive for Lyft in Orange County. Terms apply. Earn a $1000 after your first 125 rides when you Drive for Lyft in San Jose. Terms apply. Shop and Earn a $300 bonus after your first 100 ride when you Drive in New England. Terms apply. Earn a $1250 after your first 125 rides when you Drive for Lyft in Sacramento. Terms apply. Earn a $1000 after your first 125 rides when you Drive for Lyft in Philadelphia. Terms apply. Fund your summer fun by driving with Lyft to earn extra cash. Apply today to get a $300 bonus after your first 100 rides. Limited time only. Terms apply. Earn a $1000 after your first 125 rides when you Drive for Lyft in San Diego. Terms apply. Limited Time Only! Get $1000 after your first 125 rides. Terms apply. Make your golden years shine brighter by driving! Join our friendly community today and you’ll earn a $300 bonus after your first 100 rides – in addition to whatever cash and tips you make on the road. Limited time only. Terms apply. Need extra cash? Start driving with Lyft and earn a $1250 after your first 125 rides. Terms apply. Drive for Lyft in Orange County and earn a $300 bonus after your first 100 rides. Terms apply. Get $1000 after your first 125 rides when you Drive for Lyft in Baltimore. Terms apply. Earn on your own schedule. Start driving with Lyft and earn a $1000 after your first 125 rides. Terms apply. When you drive you make your own hours and get paid when you want! Get a $1000 after your first 125 rides. Terms apply. Earn a $1000 after your first 125 rides when you Drive for Lyft in Las Vegas. Terms apply. Get an extra $1000 after your first 125 rides when you Become a Lyft driver. Terms apply. Earn a $1000 after your first 125 rides when you sign up, in addition to whatever cash and tips you make on the road. Limited time only. Terms apply. Earn a $300 bonus after your first 100 rides. Meet the flexible way to earn. Start driving with Lyft. Terms apply. Get a $1000 after your first 125 rides when you Drive for Lyft in Dallas. Terms apply. Earn $1000 after your first 125 rides when you Start driving. Terms apply. Book & Earn a $1000 after your first 125 rides Drive for Lyft in Nashville. Terms apply. Get a $300 bonus after your first 100 rides. Fund your summer fun by driving with Lyft to earn extra cash. Limited time only. Terms apply. 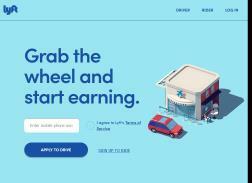 Get a $300 bonus after your first 100 rides when you Drive in Colorado. Terms apply. Book & Earn a $1000 after your first 125 rides Drive for Lyft in Minneapolis. Terms apply. Get $3 Credit per ride for 3 rides. Must be new and in an eligible market to qualify. Void where prohibited. Get $5 Credit per ride for 2 rides. Must be new and in an eligible market to qualify. Void where prohibited. Earn an extra $1000 when you complete your first 125 rides as a Lyft driver. Terms apply. Drive for Lyft in Denver and earn a $1000 after your first 125 rides. Terms apply. Drive. Get Paid. Repeat. Reliable earnings are here. Start driving with Lyft and earn a $300 bonus after your first 100 rides. Terms apply. Earn a $1000 after your first 125 rides when you Drive in Los Angeles . Terms apply. Need extra cash? Start driving with Lyft and earn a $1000 after your first 125 rides. Terms apply. Earn a $1000 after your first 125 rides when you Drive for Lyft in Washington DC. Terms apply. Earn a $300 bonus after your first 100 rides. Earn on your own schedule. Start driving with Lyft. Terms apply. Earn $1000 after your first 125 rides when you Drive for Lyft in Detroit. Terms apply. Get a $300 bonus when you become a driver after your first 100 rides. Limited time only. Terms apply. Book & Earn a $1000 after your first 125 rides when you Drive for Lyft in New England. Terms apply.